I found myself, on an ‘empty bucket’ day, with the first real chill of the season blowing against me, losing myself. I was on the bus stop and sad for no tangible reason. Then, something happened. My head nodded rhythmically. I tapped my foot in the same time. It was comforting. It was familiar. It was music. When I consider music, an artform so pervasive in my world, as an advocacy tool, I cannot help but conjure images of a motley crew of young folk who have been paraded in front of a crowd and are desperately in search of something that remotely resembles harmony. Such an image almost always touches my heart. It is, indeed, a beautiful thing to witness. But what of the heart-rending lyrics of Soul music? What of the deeply percussive reverberation of House; the aggression of Jazz; the inevitable uplift offered by Gospel; the audacity of HipHop, Rock and Metal? Where do those independent artists, who, for pennies, bleed their truth on any available stage, fit into this paradigm of advocacy and justice? Peter Bruun, in his September 13th post, said this in an attempt to define “art”: “I believe the notion of art is itself a construct; a cultural invention to imply certain shared understandings on value, meaning, and status…”. Assuming this construct (art) is indeed about the assignation of value, and there is value in music as a form of entertainment (as evidence by the gross amount of money moving through the mainstream industry), why, then, am I not, often enough, engaged in discourse regarding the spiritually restorative value of music? I wonder what happens if we choose to see those things, like popular music, as accessible avenues in our pursuit of justice. If an aggressive song puts me in an aggressive mood, and likewise, a love song is evocative of love, shouldn’t I leverage that state of being? 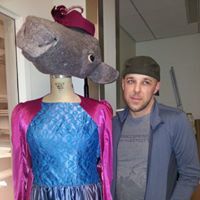 While we are not necessarily creating out of a sense of social consciousness, it still strikes me as appropriate that we might leverage said creations, nonetheless. Exciting things are happening with the Baltimore Art + Justice Project! This summer we interviewed different Baltimore based groups for our Continuum of Impact Video Series. The Continuum of Impact was created by Animating Democracy and our video series is inspired by their awesome investigation into what works in art and social justice based practice. The Continuum of Impact of Video Series Trailer is here and gives a glimpse of the great work people are doing in Baltimore. Stay tuned for the full videos coming soon! 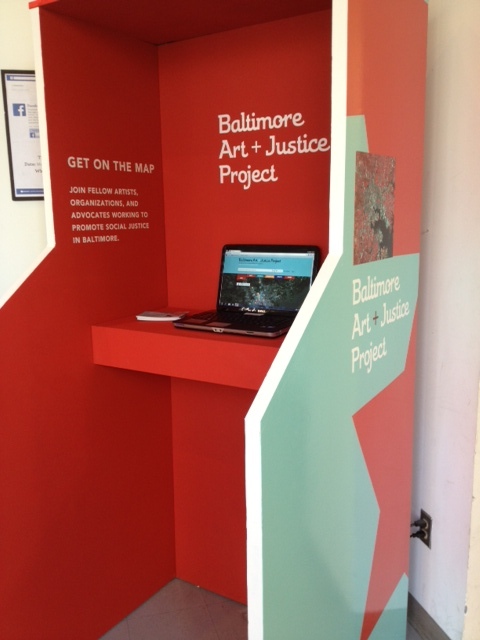 The Baltimore Art + Justice Project has a new registration kiosk! The kiosk will be moving across MICA’s campus throughout the month of November. The kiosk is currently located in the lobby of MICA’s Fox Building and will be moving to the Bunting Building the week of November 18th. If your organization is interested in hosting the BA+JP registration kiosk let us know!